Chocolate fans will want to bookmark this recipe right away. 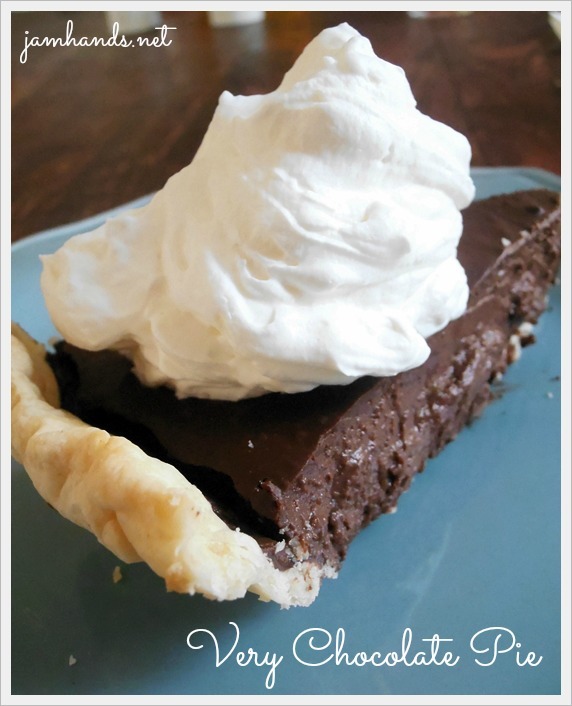 What sets this recipe apart from most chocolate pies is that it is a bittersweet chocolate flavor. If you'd like to cut the bitterness you can sweeten the whipped cream to your liking. Many thanks to Mel's Kitchen Cafe for the recipe for the filling. Enjoy! For the crust: Add the pre made pie crust to a pie plate and bake according to package directions. Set aside to cool. For filling: Whisk sugar, cocoa, cornstarch, and salt to blend in heavy medium saucepan. Gradually add 1/3 cup milk, whisking until smooth paste forms. Whisk in remaining milk, then 1/4 cup cream. Using flat-bottom wooden spoon or heatproof spatula, stir mixture constantly over medium heat, scraping bottom and sides of pan until pudding thickens and begins to bubble at edges, about 5 minutes. Add chocolate; stir until mixture is smooth. Remove from heat; stir in vanilla. Pour hot pudding into crust and spread evenly. Cool 1 hour at room temperature. Cover with a cake dome or other covering that doesn’t lay directly on the pudding; chill overnight. For topping: Place a metal mixing bowl and metal whisk into the freezer for 10 to 15 minutes. Filling recipe from Mel's Kitchen Cafe. Topping recipe from Alton Brown. Ali, this looks wonderful! When we lived in Southern California we would go to a little restaurant that served a pie almost just like this one. DELICIOUS! I'm going to have to give yours a try.